Parents hardly think twice about buying a video monitor or movement-sensing pad to make sure their bundle of joy is sleeping soundly through the night. "New parents want to know how their baby is doing at all times," says Lipoma. "This can tell you if your baby is on her stomach or her back, if her temperature spikes, if she's moving around, and if she's breathing normally." That last factor, of course, is a major fear for parents, who worry about sudden infant death syndrome, or SIDs. 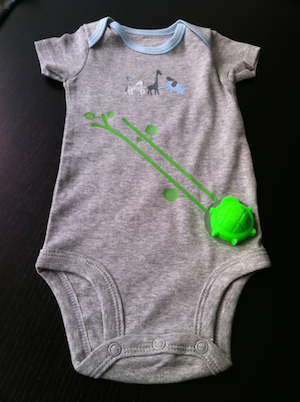 The stretchy green bands on the onesie will collect information about the infant's respiration as her chest rises and falls. Temperature and movement sensors will be built into turtle — which right now is produced by a 3-D printer at Rest's Leather District headquarters — and an audio monitor will be built into the base station. The whole system will be able to send alerts to a mobile phone, or log data from night to night on a website, allowing Mom and Dad to look for trends. "We like to call it 'quantified baby,'" says Madden, referring to the "quantified self" data-gathering movement. 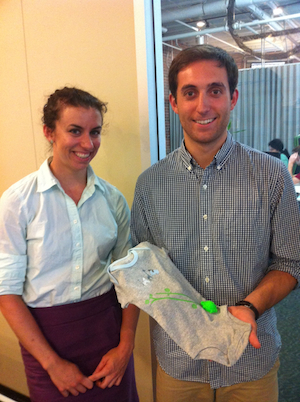 Rest has raised $500,000 in funding so far; Lipoma says they may raise more to support the onesie's launch. Initially, it'll be sold through the Rest Devices site and Amazon.com. What do you think? Could this be the ultimate baby gift for first-time parents? Or is it information overload?